This hormone is produced by the adrenals and is the prohormone for the steroid hormones. Because of this it is often called the "mother hormone." DHEA is readily converted to estrogen, testosterone, progesterone, and corticosterone. Research supports the fact that low levels of DHEA are linked to disease. You have the highest level when you are in your twenties and by the time you are in your eighties you produce only 10 to 20 percent of the original amount you once had. 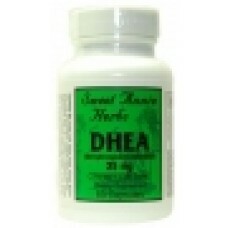 DHEA is often referred to as the "fountain of youth" for men and women. It is helpful for weight control, immune disorders, chronic pain, memory and energy.